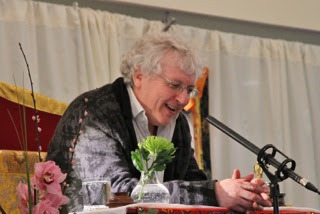 Lama Jampa taught part 3 of 'The letter to a friend' by Nagarjuna from the accompanying interlinear commentary 'The Telescope of Wisdom' by Karma Thinley Rinpoche. The main focus of the teachings was on the unsatisfactoriness of the six realms of samsara due to the gross suffering experienced in the lower realms and the temporary nature of any happiness experienced in the higher realms of existence. 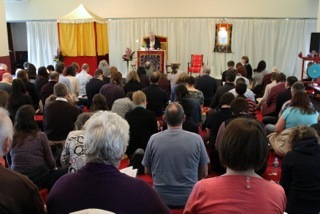 The teachings were held at Manchester Conference Centre, a spacious venue in the city centre. 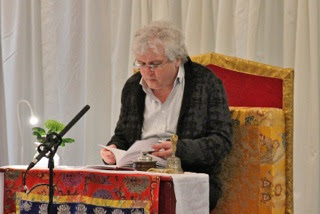 The teachings were well attended and Lama Jampa also bestowed refuge on 3 people who wished to embark on the dharma path. The weekend concluded with the initiation of Green Tara from the lineage of Chogyur Dechen Lingpa. This initiation was given in order to enable people to attend the Green Tara puja held on the 8th day of the lunar month at Kagyu Ling. Lama Jampa first received this initiation from Kalu Rinpoche when Kalu Rinpoche visited Manchester which made this an auspicious occasion that was enjoyed by those attending.